Summary : The spearmint tea available through Culinary Teas is one of my favorite loose leaf teas. Anyone who likes the taste and smell of spearmint will almost certainly adore this particular tea. Review : Upon opening the bag, the first thing a person will notice is the very strong spearmint smell. The leaves for this tea are grown in the Willamette Valley of Oregon, like many spearmint and peppermint tea leaves are. The leaves of the tea itself are quite small, although it is quite noticeable that the leaves have not been smushed or pulverized. The smaller size of the leaves has a nice fringe benefit too - it is easier to more precisely measure out the tea. This tea has an exceptional after taste. Assuming you don't eat or drink anything, you can expect to have a nice, subdued mint after-taste for more than an hour after consuming the last drop of this excellent tea. Like all loose-leaf teas available through Culinary Teas, their spearmint tea is wrapped up in a light-proof, vacumn sealed bag. While it isn't the most attractive of bagging from the outside, this method is probably the most effective method that can be used to preserve the taste and freshness of the tea. 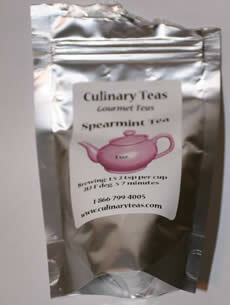 Culinary Teas sells this particular spearmint tea only in loose leaf. Bag versions of this tea are not available - although the leafs of this tea are small enough to make it fairly easy to make bagged tea on your own if you so choose. You can sweeten this tea up with sugar, although I think most people - even those who have a big sweet tooth like me - will find adding sweetener unnecessary. Moreover, be sure to NOT add a mint flavor stick to this tea. The flavor of the tea seems to react badly to mint flavor sticks. Instead, if you really must sweeten this tea, use sugar instead. So, how does this tea compare to the garden variety bagged spearmint tea you can pick up in your local grocery store? Simple - there is no comparison. After tasting this pungent and strong spearmint tea, you'll wonder why on this green earth you were drinking the supermarket stuff! Overall, this tea is highly recommended for anyone who likes the taste of spearmint. Recommendation : One of the best spearmint teas you are going to find. A spearmint lovers delight! Brewing Instructions : Use 1.5 to 2 tbsp for each 5.5 ounce cup (I did not notice a different in taste when using each of these measurements - so save your tea leaves and use 1.5 tbsp for each cup). Add boiling water. Brew for 6-7 minutes. Brewing the tea for beyond 7 minutes is likely to make the tea taste a bit on the bitter side, so beware.